As we discuss earlier (Pegged renminbi will be hard to internationalize and Asia, the next big bubble), China's loose monetary policy is starting to manifest itself in signs of an asset bubble. Part of the reason for the policy is driven by the need to keep the renminbi from appreciating (unsterilized foreign exchange interventions). As we know from the US experience, bubbles can grow for prolonged periods of time. Once an asset bubble gains momentum however, even a more restrictive monetary policy may not be able to curtail the growth. Below are some examples of this excess liquidity making it's way from the banking system into China's economy. The first two illustrate the rapid rise in lending activity, while the second two are indications of the frothy equities markets. ...banks advanced Rmb5,840bn ($855bn) of new loans in the first five months, almost triple the amount a year earlier. As for June’s lending, at $220bn it was a blockbuster as banks pumped up their quarterly loan numbers, just as they did in March (to $280bn). 2. Interbank lending activity. In the US (and Europe as well), banks are only now starting to actively lend to each other. However the liquidity is "trapped" in the banking system, and so far is not making it's way out into the real economy, i.e. there is no "multiplier effect". 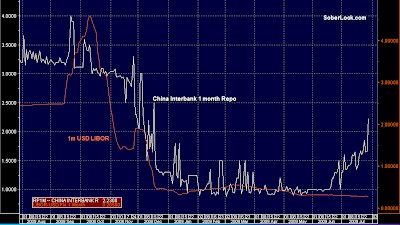 That is why USD interbank lending rates (LIBOR) have been dropping. In China, the interbank rates have gone up, indicating that banks are moving liquidity out into the real economy, creating demand for interbank loans. The multiplier effect is definitely in play. 3. 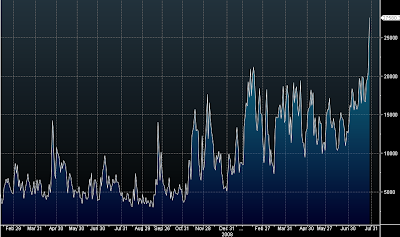 The liquidity is making it's way into the equities market: The Shanghai Stock Exchange volume chart below tell the story. China State Construction Engineering, whose $7.3 billion initial public offering last week was the world’s biggest in a year, jumped 90 percent to an intraday high of 7.96 yuan, or $1.17 — more than analysts had expected — as investors ignored the company’s relatively high valuation to pile into the stock on the first day of trading. China Construction opened trading at 6.70 yuan Wednesday, a level that valued it at 42 times its forecast 2009 earnings per share.